This article is about the equipabble characters. For the menu featuring them, see Spirits (menu). Spirits are a type of power-up in Super Smash Bros. Ultimate. They are also featured in Adventure Mode: World of Light, where they assist the fighters in defeating Galeem and Dharkon. 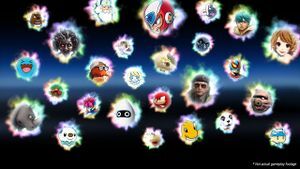 Spirits can be seen as similar to stickers in Super Smash Bros. Brawl and equipment in Super Smash Bros. 4, while they also replace Trophies from earlier installments as the successor. Spirits are characters who lost their bodies through disintegration (due to Galeem's attack) and were transformed into disembodied souls, which were then trapped into Puppet Fighters and made to do the bidding of Galeem and Dharkon. As of version 3.0.0 a total of 1316 spirits can be obtained in game, all sorted into 35 series. The player always receives a random spirit when opening up the game for the first time. Completing Classic Mode will reward random spirits as well as a Fighter Spirit of the character played if not obtained yet. More spirits are earned on higher intensities. Adventure Mode: World of Light features players navigating through a map and entering spirit battles and winning them will unlock its spirit. Master Spirits and certain spirits are exclusive through this method. Some spirits can be obtained through chests in the mode. The Spirit Board also features spirit battles like in World of Light but after clearing a spirit battle, players must shoot the puppet fighter without hitting its shield to obtain it. Some spirits can only be obtained through this method. Some spirits can be enhanced into new, stronger spirits. There are numerous spirits that can only be gotten this way. Can be summoned from the cores of other spirits obtained. Some spirits can only be obtained through summoning. Summoning certain spirits will have them available for the Spirit Board. Some spirits are obtained through challenges. Some spirits will be available on the Spirit Board once its challenge is completed. Can be purchased through the Shop with Gold. Can be purchased through spirit shops with SP. Certain spirits are exclusive to these shops. Their respective Master Spirits must be unlocked in World of Light in order to access them. Scanning a non-Fighter amiibo for a character that appears as a spirit will award that spirit to the player. This also applies to Timmy & Tommy, a Master Spirit - scanning them before their shop is opened in World of Light will unlock it in the Collection menu, though they still must be defeated to access their store in World of Light's menus. If the player had purchased DLC from the Fighters Pass, the player can collect DLC Spirits by going to a mode called DLC Spirits. Spirits are separated by their strength which is referred to as "classes". Characters can have a single primary spirit equipped at a time. Primary spirits have two main stats: an attack rating and a defense rating, which are added together to form its total power. Primary spirits may also have an ability, which apply an additional multiplier to their power, as well as up to three slots for support spirits to be attached. Generally, a primary spirit that lacks slots will be compensated with higher stats. If a primary spirit is from the same series as the character equipping it, it gains a further 1.1x power boost. Primary spirits' attack and defense stats modify how much damage is dealt and received by the character, but do not affect knockback dealt, and are not factored into the knockback formula. For both stats, a value of 0 results in no change from base damage. The damage dealt multiplier is equal to 1 + attack/2500. Therefore, an attack of 2,500 results in double damage, 5,000 is triple damage, and so on. The damage taken multiplier is a more complicated 1/(1+(7-1)(defense/10000)). Therefore, a defense of 2,500 results in taking 0.4x damage, while a defense of 5,000 results in taking 0.25x damage. In addition, increased attack will cause smash attacks to charge faster, while increased defense will improve shield durability. Because of the nature of these functions, defense is a more effective stat in terms of raw numbers, in the sense that a defense of 1,000 is stronger than an attack of 1,000 (which is the case when stats are equal at any value). However, defense is also slower to rise as its magnitude increases, whereas attack rises at a constant rate. Some primary spirits can be enhanced at level 99, which functionally means they transform into a different primary spirit with a higher rank, more powerful stats and an added ability. Furthermore, enhanced spirits tend to have higher stats than non-enhanced spirits of the same rank. Primary spirits also have strengths based on their type, and grant a 1.3x increase in damage dealt to spirits that their type is strong against. However, they will also impose a weakness of 0.85x damage dealt to the type of Spirit that they are weak against. There is also a fourth type, Neutral, which is not strong or weak against any other type. Most Primary Spirits have slots, which can be filled by Support Spirits. The Support Spirits will give fighters skills: passive bonuses such as starting with an item, resistance to certain damage types or status effects, added abilities, and more. They can be useful when encountering traps that appear in certain Spirit Battles, such as winds that constantly push fighters or floors that put any fighter to sleep on contact. The fighter can equip up to three Support Spirits at a time depending on how many slots the Primary Spirit has, although some Support Spirits can take up more than one slot. Support Spirits are also divided into types like Primary Spirits, but only during Spirit Battles where they are equipped by an enemy Puppet Fighter. Fighter Spirits are based on an existing playable character in the game, do not have classes and types, and also cannot be equipped. Rather, they simply exist to allow the players to view their artwork. They are earned by completing Classic Mode with the indicated fighter, by purchasing them when they appear randomly in the shop, or through completing some challenges. With some exceptions, the Fighter Spirits generally use the fighter's artwork from their franchise of origin, with the option to swap to their Ultimate render. Characters with significant alternate costumes will have fighter spirits based on them as well, such as Cloud in his Advent Children outfit or Mario in his Builder and Wedding attires, or those who are changed into different individuals, such as Male Wii Fit Trainer and each of the Koopalings. This notably does not include Isabelle in her winter outfit or Link's Hero of the Wild set. Master Spirits are a type of Spirit that cannot be equipped. Once unlocked, Master Spirits run facilities that can be used. These facilities include Shopping (which sell spirits, items, and Skill Spheres), Gym (which level-up spirits), Explore (which bring back rewards), and Dojo (which teach styles to spirits). Master Spirits have dialogue boxes, though certain spirits (such as Kraid) communicate unintelligibly and therefore have provided translations. Master Spirits are all considered Neutral types when used by puppet fighters in Spirit Battles. Most spirits can be obtained via Spirit Battles, which appear similar to the thematic missions seen in Event Matches and Super Smash Bros. for Wii U's Special Orders. Battles can be selected from the Spirit Board, containing up to ten spirits to challenge. The Spirit Board will cycle out new spirits after a short period of time. Each Spirit Battle contains unique challenges and rules. The spirits that are battled against will be paired with puppet fighters of a similar personality and/or appearance, with the battle's rules, conditions, stage and music track often being reflective of the spirit itself. During all battles against spirits, the Final Smash Meter will be active, and certain spirits can make the gauge fill up faster or slow the rate the enemy's gauge fills at. A spirit can be acquired by defeating its respective puppet fighter, then attacking the fighter in a shooting-style minigame. There is a shield that prevents the spirit from being acquired; however, the damage to the shield carries over to the next time that spirit is encountered and Spirit Points can be spent for one additional attempt per battle. There are also usable items that can slow the speed the shield rotates at or remove part of the shield. Before each Spirit Battle, the two sides' strength will be compared. The higher the player's advantage over the spirit, the easier the battle will be, but fewer rewards will be earned if the player's strength is significantly greater than the spirit's. There are consumable items one can earn or purchase to make the spirit obtaining process easier. Examples include restocking the Spirit Board, rerolling the board, or forcing the reappearance of a previously fought Spirit, for either a second attempt at acquiring it or the chance of acquiring a duplicate. One can also battle other players locally in versus matches with spirits equipped, working in a similar manner to character customization from Super Smash Bros. 4. As of version 2.0.0, up to four players can engage in a Spirit Board battle at once, and both the difficulty of the fight and the rewards for completion will be scaled accordingly; however, the battle will end in failure if any human player is KO'd. Inkling equipped with the spirits of Gooey (Primary), Lip, Nabbit and the Ouendan (Supports). When used in a battle, Primary Spirits will gain experience regardless of its outcome. A sufficient amount of experience will allow the spirit to level up, which increases its stats. Some Spirits can also be enhanced upon reaching level 99; this causes the spirit to change to a new spirit, which will be at level 1 but compensate with a higher class and superior base stats. Additionally, spirits available via enhancement typically cannot be found in Spirit Battles. Spirits can also level up by using Snacks or Cores on them; using a core of the same type as the spirit will give an additional boost. Spirits can level up by training in the gym, learn a style that alters their stats in the dojo, or hunt for treasure. Spirits must remain in a facility for an extended period of time to gain its benefits and cannot be used while deployed in a facility, but they can be recalled at any time; however, a Spirit recalled from a facility must wait a short time before being sent to a different facility. All facilities must be unlocked by defeating their corresponding Master Spirits in World of Light before they can be used. When selecting Spirits to use a facility, some of them may have arrows displayed on them. These spirits will be more or less efficient at whatever they were assigned to do, depending on the way the arrow points. All unlocked facilities can be accessed at any time from the Adventure Mode's Pause Menu, or from the Collection subpage at the Spirits menu. The Gym will level up Spirits as long as they remain assigned there. It is operated by Doc Louis. Dojos teach Spirits different Styles. A spirit with a Style active will alter its user's stats, boosting some stats at the expense of other stats. A Spirit can only know one Style at a time. Learning a new Style will cause the Spirit to forget any pre-existing Style. Previously forgotten Styles can be re-taught instantly. Demon Style, operated by Ryoma. Majorly increases offense, but majorly decreases defense. Land Style, operated by Cap'n Cuttlefish. Increases ground power and move speed, but decreases air power and jump height. Air Style, operated by Peppy Hare. Increases air power and jump height, but decreases ground power and move speed. Brick-Wall Style, operated by Copper & Booker. Majorly increases defense, but majorly decreases offense. Boulder Style, operated by Darunia. Increases defense and move speed, but decreases offense and jump height. Big-Bee Style, operated by Honey Queen. Increases defense, jump height, and weight, but decreases offense and move speed. Runner Style, operated by Dr. Stewart. Majorly increases move speed, but majorly decreases jump height. Gravity Style, operated by Gravity Man. Majorly increases jump height, but majorly decreases move speed and fall speed. Tank Style, operated by Kraid. Increases offense and defense, but decreases move speed and jump height. Lightweight Style, operated by Wii Balance Board. Increases move speed and jump height, but decreases offense, defense, and weight. Strategist Style, operated by Riki. Increases special-move power, but decreases attack power, throw power, and item power. Equipment Style, operated by Dyntos. Increases item power and amount of healing received by items, but decreases attack power, special-move power, and throw power. Overthrow Style, operated by Zangief. Increases throw power, grab range, and grab power, but decreases attack power, special-move power, and item power. Ninja Style, operated by Kat & Ana. Majorly increases throw power, grab power, item power, move speed, and fall speed, but majorly decreases attack power, special-move power, defense, and weight. Forgetful Style, operated by Slowpoke. Allows a Spirit to instantly forget a Style, disabling any stat alterations it imposes. Spirits can be sent for treasure, with a chance of finding valuable items, SP, Gold, and the like after a given period of time elapses. The exact rewards vary depending on several factors, including the specific Explore facility used, the types, levels, and ranks of the spirits assigned there, and any styles those spirits might possess. Ruins, operated by Toadette. Takes 2 hours to complete, and mainly awards SP. Cave, operated by Charlie. Takes 6 hours to complete, and mainly awards items for the Spirit Board. Jungle, operated by Linebeck. Takes 10 hours to complete, and mainly awards snacks. While Spirits can sometimes be bought from the Vault's Shop for Gold, there are also five other shops that can be unlocked after defeating their corresponding Master Spirits in World of Light that use SP for payment. Each of these has a selection of spirits with a particular theme, and may also sell snacks, support items, and Skill Spheres. A few spirits can only be found in these shops. Spirits can also be dismissed; while this removes the spirit, the core a dismissed spirit leaves behind can be used to create a new spirit when combined with other cores or level up other spirits. Some spirits can only be found by summoning them with specific cores. Spirits can also power up Figure Players, but will be permanently consumed. The Figure Player will gain any abilities the Spirit used to power it up may have possessed, and will be considered the same type as that Spirit. All Support Spirits and enhanced Primary Spirits come with a skill that augments the fighter they are applied to. Unenhanced Primary Spirits instead may come with traits, modifiers which may be beneficial or detrimental. The effects of these are listed below. Abilities that increase the power of specific attack types, or increase damage dealt under specific circumstances. Abilities that decrease damage received by specific attack types, modify shield behavior, or grant super armor. Abilities that allow health recovery mid-battle. Abilities that increase ground and aerial mobility. Abilities that allow the fighter to start with an item or make items more effective. Abilities that mitigate or nullify the effects of hazards that may be encountered in the Spirit Board and World of Light. Abilities with unusual effects or otherwise do not fit into any other category. May be used to counter certain stage hazards or conditions. Especially rare abilities only found on a select few Rank 3 and 4 Spirits. Though they can feasibly be categorized elsewhere, they were considered by the developers to be powerful enough to warrant a category all to themselves. Abilities found on Primary Spirits that cannot be enhanced. Unlike skills, these traits aren't always necessarily beneficial, though Spirits with negative traits might make up for it with greater stat boosts than usual for their rank or additional slots for support Spirits. When applicable, these traits can also stack with skills with similar effects. Fist Attack ↑ Slightly increases the power of punches and elbow strikes. Foot Attack ↑ Slightly increases the power of kicks and knee strikes. Throw Power ↑ Slightly increases the power of grabbing and throwing attacks. Sword Attack ↑ Slightly increases sword-attack power of fighters like Link and Marth. Magic Attack ↑ Slightly increases the power of magic attacks, such as Zelda's and Robin's spells. PSI Attack ↑ Increases the power of Ness and Lucas's PSI attacks. Fire Attack ↑ Slightly increases the power of fire-type attacks. Water Attack ↑ Slightly increases the power of water attacks. Electric Attack ↑ Slightly increases the power of electricity attacks. Shooting Items Power ↑ Slightly increases the power of shooting items. Battering Items Power ↑ Slightly increases the power of battering items. Weight ↑ Become slightly more difficult to launch, but movement speed decreases. Weight ↓ Become faster, but also easier to launch. Speed ↑ Slightly increases run speed. Speed ↓ Slightly decreases run speed. Jump ↑ Slightly increases jump height. Jump ↓ Slightly decreases jump height. Fire Weakness Increases the damage taken from fire and explosion attacks. Water Weakness Increases the damage taken from water attacks. Electric Weakness Increases the damage taken from electricity attacks. Initial Damage 30% Start each battle with 30% damage. Despite the lore referring to spirits as characters, some spirits (such as Samus' Gunship, the Shine Sprite, and Snake's cardboard box) are based on inanimate objects instead of characters. Alter egos and other versions of playable characters, such as Kaptain K. Rool, Mario and Luigi in their Mario Tennis Aces outfits, and various yoga poses being performed by Wii Fit Trainer, also appear as spirits, despite not being separate characters. There are also spirits based on groups of characters, such as Piantas and the Tiki Tak Tribe, although by definition, each spirit should represent one individual character. The highest value for a single stat is possessed by the Absolutely Safe Capsule, which has a defense stat of 10,000, but 0 for attack. With 1,297 Spirits contained within the base game of Ultimate, it surpasses the amount of Stickers in Brawl by 597, as there were only 700; it even surpasses the number by 53 when combined with the Trophies from Brawl, as there were 544 Trophies, for a total of 1244 in Brawl. There are only 5 support spirit effects that cost three support slots, those being Super Armor, Great Autoheal, Ore Club Equipped, Poison Heals, and Double Final Smash. Among these effects, "Ore Club Equipped" is the only effect that doesn't pertain to a Legend class spirit (being for Ace class spirits). It is also the only three-slot effect used by multiple spirits. Timmy and Tommy is the only master spirit that can be obtained via amiibo. This page was last edited on April 22, 2019, at 00:59.